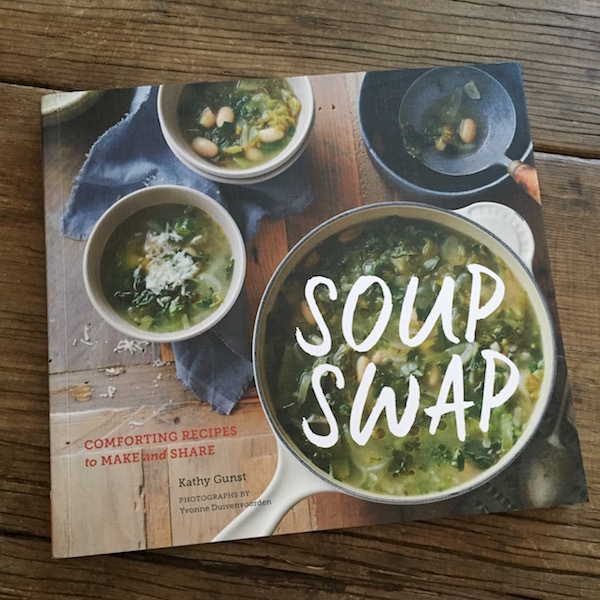 I was so excited to be part of the launch for Soup Swap: Comforting Recipes to Make and Share , as I absolutely LOVE the idea of getting friends or neighbors together to have dinner and exchange home-made soup. I’m already thinking about organizing a swap here in San Diego once it cools off. (September is one of our hottest months.) If the author’s name sounds familiar, it’s because she’s the resident chef for the NPR program Here & Now. And of course, reader sweepstakes are back this month and you’ll not only win the four books featured this month (3 of them soup-related), but some other wonderful goodies that will enhance your soup-making abilities. The giveaway starts on Thursday, September 29th. 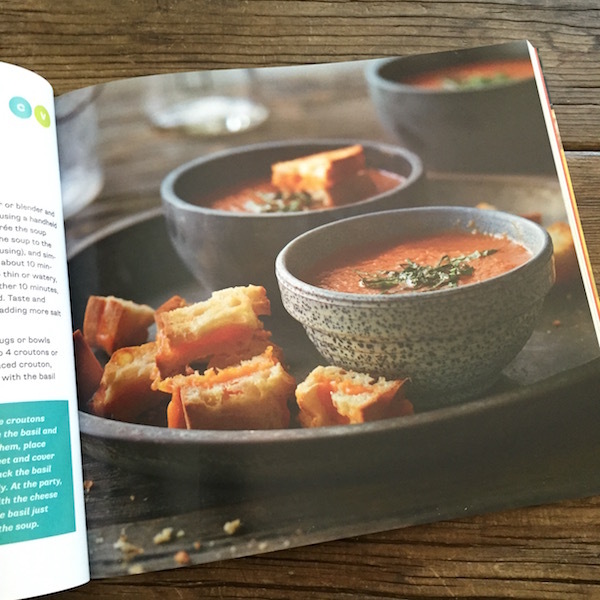 The book starts with an introduction and the basics of hosting a soup swap, which I found helpfully specific. Chapters include the foundation: making broths & stocks; vegetable soups; chicken & turkey soups; meat soups; fish & seafood soups & chowders; side dishes; garnishes and toppings. The layout is extremely user-friendly, with excellent use of fonts and color to convey the homey warmth of a winter kitchen. Gorgeous full-color photographs by Yvonne Duivenvoorden are woven throughout the book, making the recipes that much more appealing to make. Recipes include rich beef bone broth, late-fall vegetable ramen in miso-ginger broth, chicken charred tomato and chile posole, lamb and farro soup with spring vegetables, Maine lobster leek and corn chowder, red cabbage salad with blue cheese and maple-glazed walnuts (sides), and polenta croutons (garnishes). 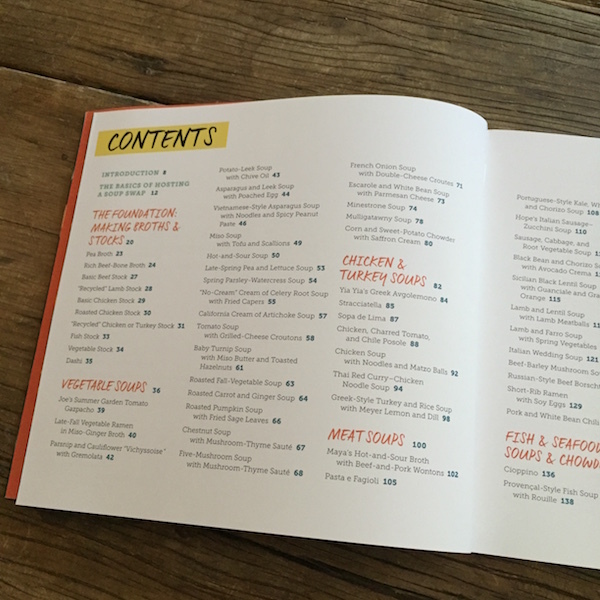 While there is a vegetarian chapter with 24 recipes, it’s probably not enough recipes to warrant buying the book if you are vegan, unless you love soup and are an expert at renovating recipes and want to use the book as a starting point. Same for gluten-free and paleo eaters. The author begins with a story about the winter of 2015 in New England. A friend had already gotten their soup swap started, but this was the winter where she developed many of these recipes, being stuck indoors for months. It gave the book a completely different feel knowing her personal story and remembering the photos from that winter. I liked that they included icons for special diets (Cold, Dairy-free, Gluten-free, Vegetarian, Vegan), and that she explains how to “travel” any recipe where she recommends special steps be taken. 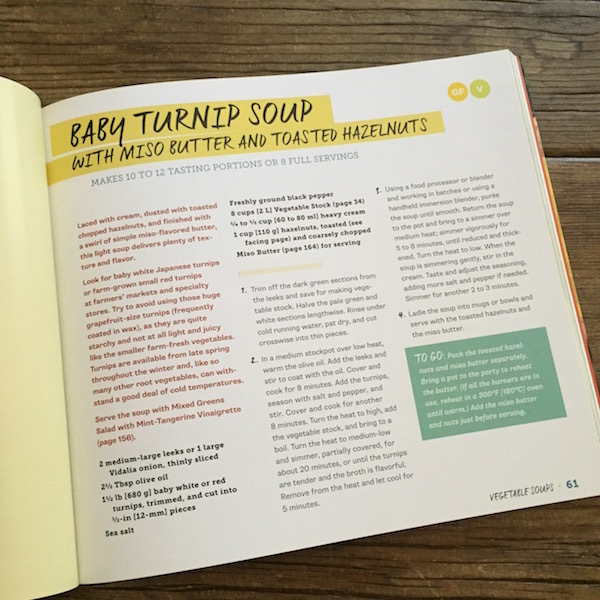 She also gives clear guidance on organizing your own soup swap, and provides two chapters of sides and toppings. Nutritional analysis is not provided, which would be helpful for low-sodium eaters. A note about my cookbook reviews: In the past, I tested at least three recipes from each book, took photos, and described my experience. Due to my dietary limitations (low-sodium, dairy-free, gluten-free, egg-free), it is no longer possible for me to test the recipes and do them justice. Required FTC disclosure: I received one copy of this book from the publisher for the giveaway on September 29, 2016.